Jose Mourinho’s return to the EPL after quitting from Chelsea was no secret, as reports of him taking up the reigns of Manchester United from Louis Van Gaal started doing rounds since January. It is obvious that United have got themselves an upgrade from many different vantage points. Mourinho brings eyeballs and attention wherever he goes. Why this matters is because, at the end of the day, the Glazers are running a sports entertainment business. While the club and the owners’ profits continue to grow commercially, it’s not something they can take for granted. As far as the fans are concerned, that shouldn’t be a worry, as it takes a lot for fans to stop supporting their team. Manchester United branded itself “World’s Most Popular Football Club” four years ago and based on surveys, it has close to 660 million supporters all over the world. This huge supporter-base is what helps United seal far more deals than most, mainly because they are a bigger brand. However, after three seasons of post-Ferguson underachievement, more of the same might have jeopardised some of those deals. Football is very competitive and so is popularity, especially today, when the bulk of a club’s support look at them solely as a brand. Mourinho can change all that. Before United kick a ball in anger next season, they will be the big story. The last time United went three straight seasons without a top-three finish was 25 years ago, but Mourinho has never faced a herculean task like this before, and as both Moyes and Van Gaal have proved, it’s not easy to fill in the shoes of Sir Alex Ferguson. When Mourinho worked with Porto, they were fifth in the 2001-02 season and he did build a stronger team, but he didn’t face the depth of competition he’ll have in the Premier League. At Chelsea in 2004, he had to work with a team that finished second and reached a Champions League semifinal the year before. Four years later, Inter were coming off three consecutive Serie A titles. In 2010, Real Madrid were two years removed from a title and had finished second the previous year with 96 points, the club’s then highest-ever total. On his return to Stamford Bridge, Mourinho took over a side that had finished third the previous year and, in the preceding two campaigns, had won the Europa League and Champions League. His main priority was to tune the teams and not to rebuild them. This is an entirely different situation. While the resources are there — from the young talent that has emerged this season to enormous transfer funds — it will be an entirely new process. What happens next at Old Trafford will play a major role in determining whether Mourinho gets the players he wants. Some have expressed reservations over Mourinho’s style of play, but those are heavily speculated. Results will ultimately be the speaking point, and he tends to deliver those. Besides, while he may not be known for his humility, he has shown the ability to play the kind of pacy, back-to-front attacking football that Old Trafford craves. Another big concern is Mourinho’s attitude regarding young talent. To some, giving playing time to home-grown talent is imperative and managers who do it, and are able to extract and nourish good talent, are praised. But, as the narrative goes, Mourinho is reluctant to do that. However, what people need to understand is that managers do what they are asked to do by the club and what they can do based on the available resources. If the kids are talented and the club encourages the manager to play them, possibly at the expense of immediate results, they’ll get on the pitch, or injuries can also offer opportunity, as was the case with United this season. So, that wouldn’t necessarily have to be a major concern at this point. However, while it is easy to draw a list of young players Mourinho has fielded — from Jese to Nacho to Mario Balotelli to Davide Santon to Nathan Ake to Carlos Alberto – it is another thing to list the youngsters Mourinho ignored who went on to become superstars. So that might alleviate some of the fears as far as Marcus Rashford and other United youth team products are concerned. The challenge now for Mourinho is to evaluate the current talent and figure out what to do. There are tons of questions to be answered. Mourinho is dying to get back to work, and the good news is that United definitely received an instant boost with his appointment, in terms of media attention and his undeniable skill. It remains to be seen as to how the mechanics and personal relationships are going to work inside Old Trafford and whether Mourinho will be given the right amount of responsibility to do his job in the best possible way. After all, that was his undoing twice at Chelsea and also at Real Madrid. Enjoyed reading this piece of article. Good stuff! 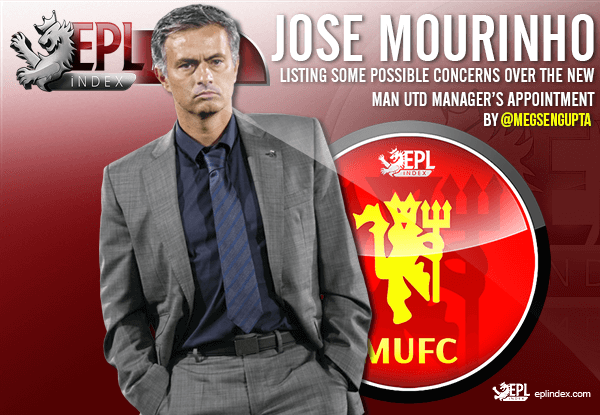 Categories: EPL Index Featured Article, EPL Team Analysis, Manchester United, and Manchester Utd (NN).' 'Tags: "Manchester United", Balotelli, Champions League, Jose Mourinho, Mario Balotelli, and Mourinho. What Has Changed For Manchester United?